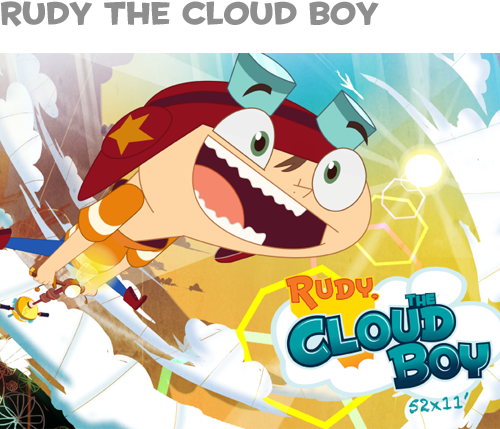 CONCEPT: Rudy the Cloud boy is a high-flying, floating, fast-paced comedy about leaping without looking, jumping while joking, reaching for the sky – and actually getting there! Synopsis: What kid hasn’t dreamed of leaping high into the sky and never coming down? Well, one adventurous 12-year-old did and it was more amazing, more exciting, and more fluffy than he could ever imagine. Meet RUDY, THE CLOUD BOY. This kid’s head is in the clouds – literally. So when Rudy discovers a strangely high-tech pogo stick in the attic of his new home he puts it to good use and gets hopping. Turns out the pogo stick is a piece of highly advanced tech that has transported him to the strange land of @MOSPHERE, to fulfill an ancient prophecy. Hail Rudy as the Cloud Boy! THE NEW CHAMPION OF TRUTH, JUSTICE AND THE CUMULONIMBUS WAY! — The @mospherians probably should have done more research!